It is entertaining watching the fur fly regarding Jesus. The mythicists and the historicists are going at it accusing each other of tainted scholarship and dullardry all over the interwebs. How timely it is that my series "Will the Real Jesus Please Rise?" is now airing. Special thanks to Progressive Christianity for promoting this series and to Bishop Spong for interviewing with me and promoting the interview. That was a nice shot in the arm for Religion For Life. You can catch my interview with Bishop Spong via podcast. Thanks to Gavin at Otagosh for this great plug! Bart Ehrman started all the hubbub with his new book, Did Jesus Exist? Because of that book I thought I would check out the opposition and read Robert Price's The Christ Myth Theory. Both of those scholars are coming up on the show. John Dominic Crossan finishes the series discussing his book, The Power of Parable: How Fiction by Jesus became Fiction About Jesus. All were gracious and the interviews are engaging. I wonder how much of the disagreement is over something rather small? The gospels as I understand these four scholars, are mostly fiction, aren't they? If there was a guy, you won't find out much about him by reading the gospels. It is the gospels' authors who steal the show. I like the grit and guts of Frodo Baggins, but the real genius is Tolkien, right? Here is a secret. None of the scholars will admit it, but it is my own personal Jesus, my ishta-deva, who is the man. Thanks also to Gavin for this diagram via Triangulations. Along with Gavin, I am the red egg with the little yellow yoke in the top right. I am behind door number two, "fictionalized myth based on some real person." A "Skeptical Non-Christian" Christian. 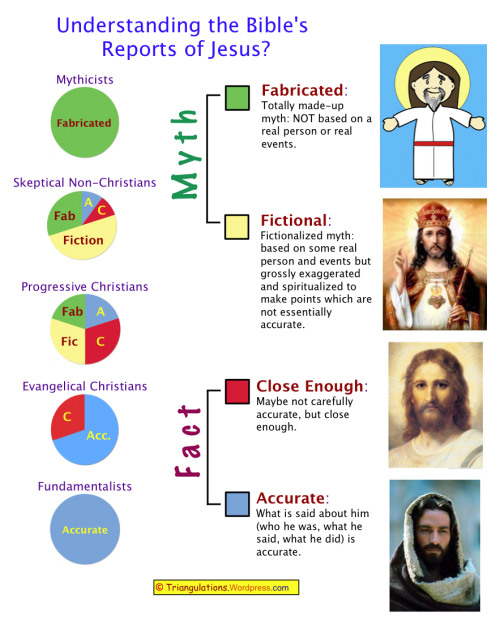 That puts Jesus in the same category as Sherlock Holmes and Popeye, surely? Could be. I was thinking more along the lines of Abraham, Moses, David, Solomon,and Elijah just to keep it biblical! It depends how big we think that little yellow circle is in that diagram and what degree of continuity it has with the big red circle. As I see it there is just no definitive way to compare and contrast the person from the story. VERY provocative stuff, John -- and VERY helpful diagrams. Keep on! 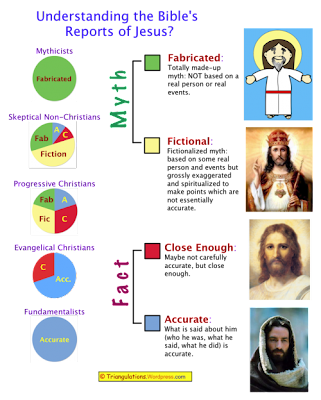 I don't completely like that second diagram ... does it mean you get demoted from 'Christian' after you learn enough true history to recognize the literary character of the portrayal? Michael, I agree. 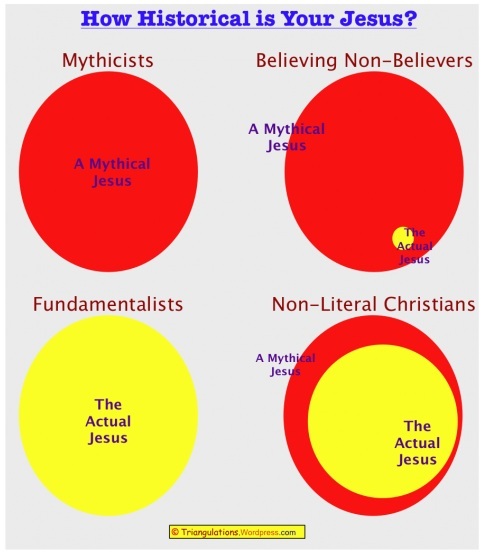 I think you can be Christian and be either in the second or top diagram as well as any of the others. Hey John, Thanx for posting my diagrams. I got a few peaks from folks. Thank you, Sabio, they really helped!